Over on Reddit, it's a running joke that everything you can possibly imagine, and most of the things you can't, have their own subreddits. To the point where the running joke itself has its own subreddit just for posting links to the weirdest ones you've found. My point is, this is the first time I've heard that there's a website dedicated to just cataloguing lists of numbers, and my reaction is simply "of course that's a thing". Oddly, I already knew about OEIS. In fact, I was the one who suggested the entry A133377 to the guy who submitted it. Then the next question would be how to submit it? Gzip was too big to be practical. So were bzip2 and xz. Oddly, bzip2 did the best, and it's pretty orderly. So I decided to try bzip2 on it again. It works quite well. The main problem is I estimate it would take five days to generate the full 200TB! If you zip it, is it still 200TBs of 9s? psst… use a run-length encoder first. Millah wrote: If you zip it, is it still 200TBs of 9s? Hm. If each "9" is a byte, then I think it's still 200TBs of 9s. But maybe not. 270 billion 9s took 5088 bytes. Then, 200TB of double-bzipped 9s would be...about 10 sextillion 9s! drachefly wrote: psst… use a run-length encoder first. I didn't think they could read a run-length encoder's files. I figured maybe they could read bzip2. As it turns out, they can't. But they'd probably take a Perl program. Backreferences are just as good as run-length encoding, the limit here is that common implementations (zip/gzip/deflate etc) have a fixed bit-size for the "length" parameter. For example, a backreference in DEFLATE is at least 24 bits long but has just 8 bits for length. The maximum compression factor is 1:86 = ~1.1%. bzip2 should produce great results here. The first three steps (initial RLE, burrow-wheeler transform, MTF) are counterproductive in this case, but you still end up with a string with reasonably long runs - an input of ~43MB will end up as 5 different runs instead of just one. /edit: actually, screw RLE. All you need is a good entropy coder, because the entropy of 200 trillion '9's followed by 'eof' is just around ~49 bit, plus header. Steve the Pocket wrote: Over on Reddit, it's a running joke that everything you can possibly imagine, and most of the things you can't, have their own subreddits. To the point where the running joke itself has its own subreddit just for posting links to the weirdest ones you've found. My point is, this is the first time I've heard that there's a website dedicated to just cataloguing lists of numbers, and my reaction is simply "of course that's a thing". The OEIS existed before Reddit made this kind of thing cool, though. According to the OEIS web site, it was founded in 1964... Although I have trouble reconciling that date with the "On-Line" part of OEIS, since that's five years before ARPANET. 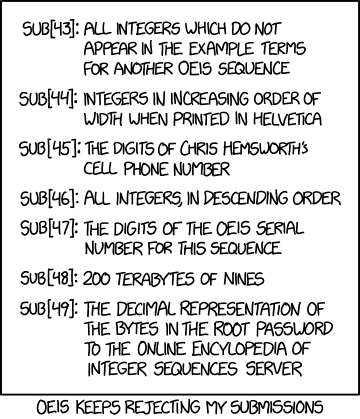 GlassHouses wrote: The OEIS existed before Reddit made this kind of thing cool, though. According to the OEIS web site, it was founded in 1964... Although I have trouble reconciling that date with the "On-Line" part of OEIS, since that's five years before ARPANET. If you dig a bit deeper, you'll find it was originally just the EIS, kept on paper. I've used it in the past in my course on analytic combinatorics. and when reading the description, we now know why randall's submissions get rejected: not because they're dumb, but because they're not precisely enough defined. It wasn't rejected, it was... workshopped. Best clickbait of the month. I fear for the future of mankind if anyone tries to unzip that string. I knew about OEIS already. Plus I'm an OTTer. They were right when they called me a nerd. Loving how one of the key details is related to keming. Ken_g6 wrote: Gzip was too big to be practical. So were bzip2 and xz. Strangely enough, I can zip 200TB of "9" into a rather smaller file. How? Don't zip and gzip use the same compression algorithm? I dunno, but I do know duplicate replies occasionally sneak into threads. Last edited by cellocgw on Tue Jul 10, 2018 6:32 pm UTC, edited 1 time in total. Ken_g6 wrote: So I decided to try bzip2 on it again. It works quite well. Surely this shouldn't happen? It would mean bzip2 isn't a very good compression algorithm, since the entropy of its output should be maximised and therefore uncompressible? EDIT: Oh, there are repeated blocks in the output, so recursive compression will make it smaller, right. Still, I wonder why the algorithm doesn't handle this itself, and repeatedly apply until no reduction is found, and prepend the number of decompression steps as an extra byte at the beginning, normally 0x01. Truly a Zen koan for our time. grkvlt wrote: Still, I wonder why the algorithm doesn't handle this itself, and repeatedly apply until no reduction is found, and prepend the number of decompression steps as an extra byte at the beginning, normally 0x01. Perhaps because there's not much call for 200TB of 9s, and the added complexity isn't worth the added benefit? Some file compression algorithms do this. This has led to malicious files that recursively decompress to "data" petabytes in size, or worse, carefully constructed files that decompress back into themselves infinitely. Being the sort of oddball that I am, I can't help but be amused that they changed it to Arial because Helvetica is "proprietary". Do they think Arial is in the public domain or something? 'Cuz it ain't. An objection that was raised immediately on the OEIS mailing list I haven't checked if it's been resolved. Yerushalmi wrote: An objection that was raised immediately on the OEIS mailing list I haven't checked if it's been resolved. I really hope there is an online archive where we can read this assuredly amusing exchange, and that someone will link to it. Definition: Except for a(1) = 1, rearrangement of natural numbers such that a(n) is not equal to n, but the prime signature of a(n) is the same as that of n.
The only way for myself to use genuine Helvetica would be to write a Postscript file, re-activate my first PC and send the file to the legacy HP LaserJet 4ML postscript printer that has an authorized built-in capability to interpret Helvetica correctly. Even the expensive Adobe CS tools like Illustrator, InDesign, etc. didn't include the Helvetica font in the standard installation. Arial was available, an I'll use InDesign and its pdf export to create the announced graphical example. So the task described in the comic " .... printed in Helvetica" is only solvable for graphics professionals with access to a licensed copy of the font. which seems to use FontForge https://fontforge.github.io/en-US/ for the conversion. I don't think that there is anything violating license rules with this procedure. http://download.macromedia.com/pub/deve ... 4_AFMs.zip , which includes helvetica.afm. From its content, it seems that "integers... printed in Helvetica" would produce massive differences to "printed in Arial", due to the absence of the kern pair definition "KPX one one -74" found in arial.afm, but not in helvetica.afm, that causes the shrinking of print width for numbers containing consecutive ones. To be provocative, one can say "Arial intentionally messes up the printing of numbers". See the second (Earl Jenkins's) answer in https://stackoverflow.com/questions/394 ... ost-pixels and David Harralson's answer in https://www.quora.com/Why-did-Microsoft ... to-Calibri for some historical background. Entropy coders need implementations. If Bzip2 starts with an RLE and doesn't just completely finish right there, then they didn't design it with super-huge runs in mind. Also, you're supposed to put the BWT before your RLE. Why RLE first? drachefly wrote: Also, you're supposed to put the BWT before your RLE. Why RLE first? bzip has two RLE steps. Both RLEs have different encodings and maximum run lengths. The first one is supposed to guard against worst-case inputs; due to its inefficient (but fast) encoding it will actually enlargen most inputs. IIRC the author has since claimed that including it was a mistake.